Anyone who uses Facebook for social media marketing is looking for that magic bullet of content: What can I post that will get my fans talking, make them loyal, and spread the word about my business? One of my favorite local small businesses has figured it out. 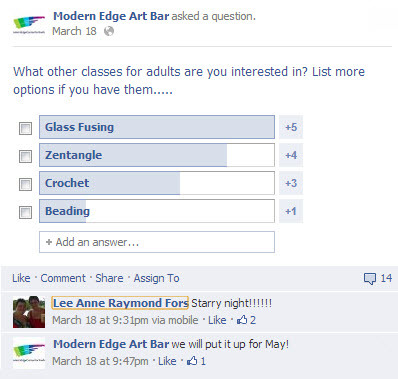 Modern Edge Art Bar is a studio in my area that offers BYOB painting classes, jewelry classes, birthday parties, and kids classes. I have taken 3 of the BYOB classes, and was thrilled as a non-artist that I could have so much fun with my friends and walk out with a painting I am proud to hang up at home. 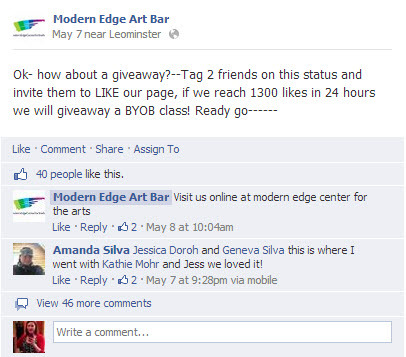 When I first heard of Modern Edge last summer, and liked their page, they had a few hundred fans. Since then, they’ve grown to 1,200 fans and have expanded their business – last month they moved to a larger space, increased their staff, and added more classes. Modern Edge doesn’t post bland text updates about products or services. They share information about their business in a friendly, helpful way. This post is about a possible painting for a future BYOB class – it got 33 comments and 133 likes. There is no mystery about what happens in a Modern Edge art class. They post photos of what project the class will work on. They post during a class. They post photos of happy artists with finished projects. This is the cover photo they posted after a class I attended with my friends. Modern Edge instructors are trained and skilled art teachers. But you can’t fill your classes if no one wants to learn what you’re teaching. They keep their classes fresh by asking their fans what they want. 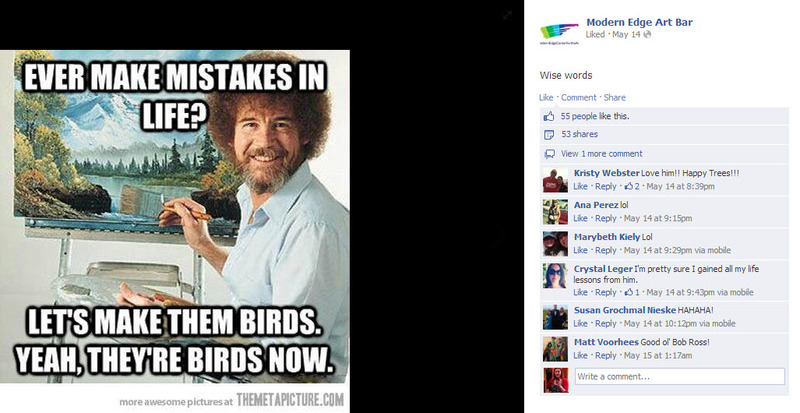 This Bob Ross meme is spot-on. It’s about art and it’s entertaining to fans, which is why it got 53 shares. 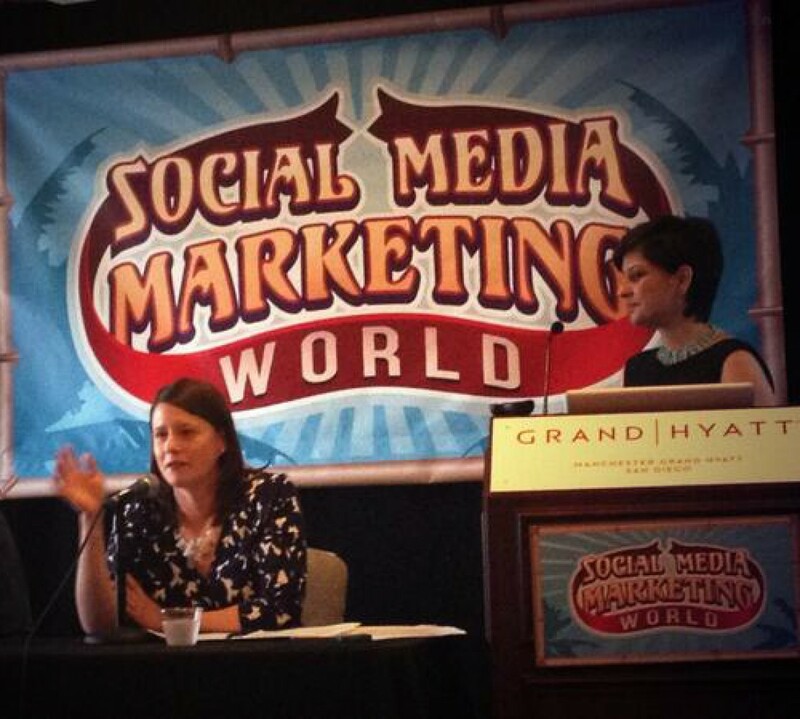 Need more help with Facebook marketing? Check out my other posts about Facebook! You’re spot on about the images and “not all business” part. We’ve found that on-topic humor CAN be funny if the image is ironic or otherwise unexpected with the commentary.